A week ago, we received a box via FedEx. Upon opening it, I was bowled over by the amazing smell of Christmas... specifically, the aroma of Balsam fir. Getting further into the incredibly well-packaged box, I was able to pull out a beautiful Christmas wreath. I just stood there and breathed it in. I had no idea what to expect from a mail-order wreath. I feared that it would arrive looking pretty dead and lifeless. Nope. Not my Wreaths of Maine wreath. There were quite a few loose needles, but the included care instructions told me that is to be expected and it is just part of shipping it... it is not an indication that the wreath is dried out. And they were right... picking it up, this wreath certainly was fresh. And FULL --- this wreath is well-made and hand-made (I found it really interesting to read about HOW they make the wreaths), full -- absolutely beautiful. I know from looking around while out and about this past weekend that I would spend nearly as much for a skimpy wreath, and one that doesn't smell so Christmasy. We live in the middle of nowhere, and we rarely have visitors (except for people delivering review packages!) We also do not have doors that are really meant for hanging anything on them. And... selfishly, I wanted this wreath to hang where people -- okay, where I -- would actually see it. And smell it. So the kids helped me to arrange it, as it comes with the bow packed in the middle (to avoid being crushed). It now hangs in our living room, above the computer desk. Everyone sees it every day. 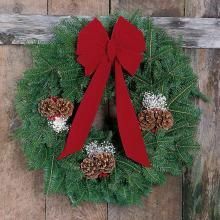 For indoor use, Wreaths of Maine recommends a light daily misting of water... as that "will help bring out the balsam aroma and will help keep it fresh for weeks." They were right. Well, I can't speak to the "fresh for weeks" part yet, but after one week, it still feels, looks and smells like it was just made. For people who actually have neighbors who could actually SEE these things, hanging it outdoors, even in freezing temperatures, is actually preferred. This wreath would look lovely on the door, which is what I had intended. Until my first sniff, when I knew it had to be inside. In many parts of the country, this wreath would last all winter. NOT in my area, I am sure. Here the temperatures vary so much all winter, and it would take a beating from the sun. 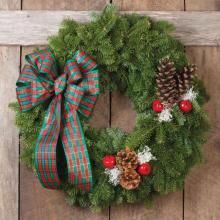 The incredibly neat thing about Wreaths of Maine, though, is that it is something that can be done as a homeschool fundraiser. You start earning commissions with the first wreath sold, and there are some fun bonuses when you sell 15 wreaths, and more if you hit 35. As part of the TOS Homeschool Crew, we received the sales kit, which is normally available for $10 (that cost is refunded in the commission check if you sell 10 wreaths). I was impressed with how straight-forward everything is... really easy to understand and written to the homeschool student (like instructions for if a door to door customer pays you in cash... you are to give the cash to your parents and have them write a check to Wreaths of Maine). As you can see, the sales kit includes color brochures, four different sheets with instructions on various aspects of how to do this, a sample gift card, order forms, labels and even the envelopes you need to mail the orders in. I could easily hand this to my older boys (ages 11, 12 and 14) and they would be able to go through it and know what the process is, when and how to actually place orders, and when to expect a commission check. They also send out emails with updated information about promotions, reminders about deadlines and other pertinent information. That's how I learned about the deal I'll mention next! Sales can happen in person or orders can be placed online. (And, ummm, if you want to order one, Footprints in the Butter is seller number 5059!) Wreaths start at $31, and there are a few different styles. And if you enter the code TOS, you receive a 12 month subscription to The Old Schoolhouse! Disclaimer: As part of the TOS Homeschool Review Crew, I did receive a sales kit and a wreath in exchange for my review. All opinions are my own. For more about my take on reviews, visit my blog post here. Great review and I totally forgot about the free TOS subscription! Great post! Just to note about doors, in case someone actually wants to put their wreath on one. Do not hang it between a glass "storm door" and the wood door. The son will bake it! Hang it outside -- like you said, the weather won't hurt it. It's Time for Learning... and Fun!